21 april, Leeuwarden nederland, BIS,BISS,multi Champion EL Minja's Thsang-Pa won Best of Breed and Best in Group under Mr Redlicky and 4th Best in Show under Mr Martin van de Weyer at one of the most prestiges dogshows in the Netherlands,the Frisian Leeuwarden international. 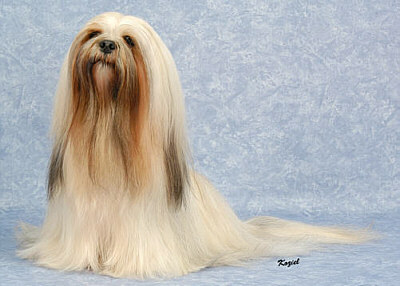 Lhasa Apso's from several countries were presented! BIS,BISS,multi Champion EL Minja's Thsang-Pa ! 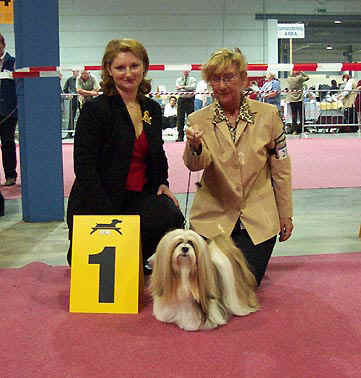 1 april 2003, Poland, CH EL Minja's May Boy obtain last CWC on 30 march at the dog show in Katowice for title Champion of Poland.Congratulations to you Eliska. 22/23 March 2003, Hong Kong ,China: EL Minja's Twister won both days of showing 2 times the CC's and BOB this for coming up to be Hong Kong Champion, EL Minja's Daisy was presented in the junior classes and obtain her junior warrant, Congratulations to you Andrew. 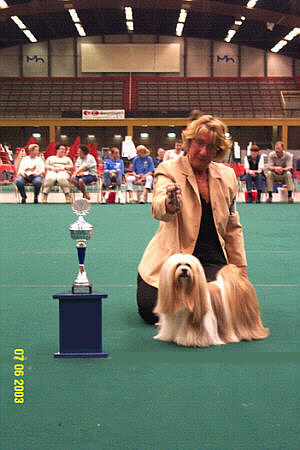 23 March 2003, Wieze,Belgium multi CH.EL Minja's Good as Gold won CAC CACIB, under judge Mrs J Custot. 17 March 2003,Colorado,USA,BIS,BISS,CH EL Minja's Walk on Water`won 2 times BOB under Margaret Robertson, Canada; Richard Lopaschuk; Canada & Walker Falk; Minnesota. CH EL Minja's Walk on Water also picked up a Res.Best InGroup at Saturday's show. Special thanks to the judges and to Fran Strayer Walker mum! 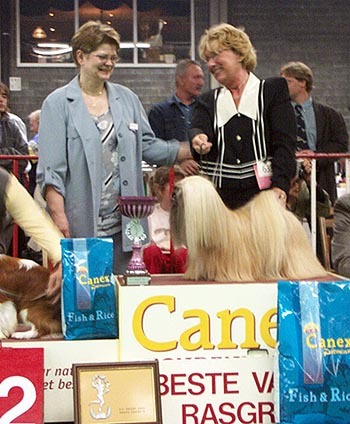 2 March 2003, Zuidlaren,Holland,multi CH.EL Minja's Good as Gold won CAC CACIB, and Best of Breed under specialist judge Mr Walter Holtorf and obtain 4th place in the Group 9 under judge Mrs Monique van Brempt. thank you judges; Mrs Van brempt and mr Holtorf. 3 years Solid gold high typical female with the ideal size, Very good head proportions.Good dark eyes; correct bite;good wide in line; Excellent fore and back hand angulations; Compact body with good topline and correct built wrist; Full in typical coat; fluent movement with excellent drive; correct carried tail. CAC CACIB best female, best of breed ! 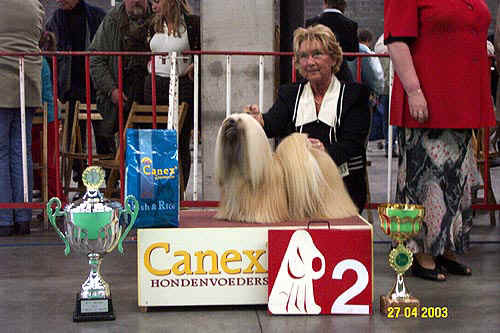 23 may 2003 , Oss-Berghem in the Netherlands, BIS,BISS,multi Champion EL Minja's Thsang-Pa won Best male with CAC and Best of Breed. The reserve CAC went to BISS.Am.CH EL Minja's Walk on Water who was entered in the openclass. 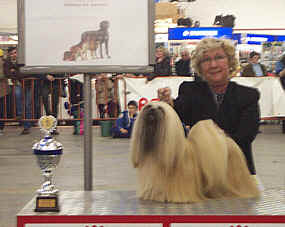 The best Lhasa Apso female become multi CH EL Minja's Dream On and she obtain with this CAC the Dutch Champion Title. Thank you judge Mr Martin van de Weijer. CH EL Minja's Thsang-Pa finished BIG4 under Judge Mr Peter Prins both Dutch judges. 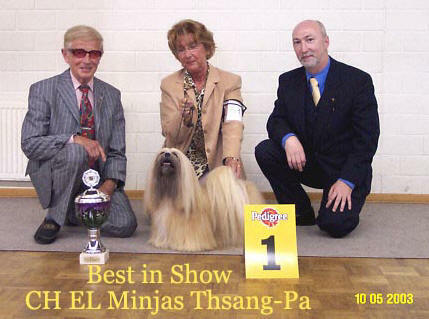 10 may 2003 BEST IN SHOW at dogshow in Germany for my, BIS,BISS,multi Champion EL Minja's Thsang-Pa and best Lhasa Apso female for multi CH.EL Minja's Good as Gold and last but not least best junior male with jugend CAC for Le Sajnim Indian Dream! 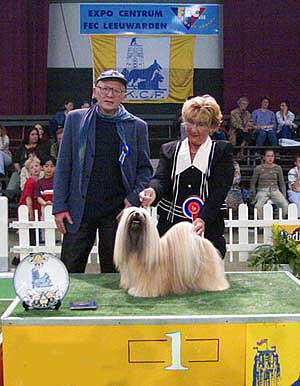 10 may 2003 Czech Republic,at the Lhasa Apso Specialty show in Hlucin. CH.EL Minja's May Boy obtain best male with CAC and won the breed with BOB! Congratulation for Eliska Vaskova, judge was Mr. Boryczko from Poland. 3-4 may 2003 dogshow3-4 may 2003 dogshow weekend for us at the International Dogshow in Goes, Nederland on saterday and the International Dogshow at Amiens in France on sunday, BIS,BISS,multi Champion EL Minja's Thsang-Pa obtain the CAC CACIB awards and The Double Best of Breed this weekend under Mrs A.Cuthbert in Goes,Nederland and under Mlle Lydie Estru in Amiens,France. Multi Champion EL Minja's Dream On obtain in Goes the CAC CACIB awards and in Amiens the res.CAC CACIB many thanks to the judges for Mrs A Cutberth and Mlle L.Estru. New International Champion; multi Champion EL Minja's Only for Pleasure obtain her International Champion title in Erfurt under judge Mr J Pohling and CAC CACIB she is owned by mr F Koziel, congratulations Frank. 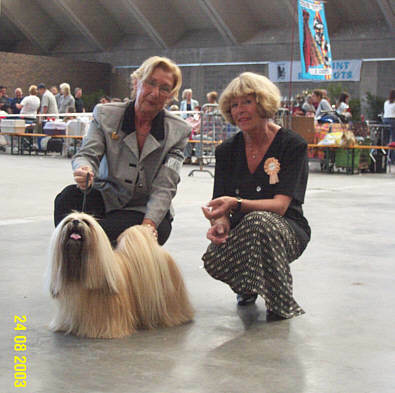 27/28 april, Antwerpen, Belgium, BIS,BISS,multi Champion EL Minja's Thsang-Pa won Best of Breed under Mrs Agneta Pamp and Best in Group under Mrs A Heikkinen and Best in Show of the Day under Mrs Dr R Trainen finally under the judges Mrs. Trainin,De Ridder and Sirik res.Best in Show, thanks to the judges and our supporters. 21 april,Leeuwarden nederland, BIS,BISS,multi Champion EL Minja's Thsang-Pa won Best of Breed and Best in Group under Mr Redlicky and 4th Best in Show under Mr Martin van de Weyer at one of the most prestiges dogshows in the Netherlands,the Frisian Leeuwarden international. Lhasa Apso's from several countries were presented! februari 16,2003, Hoogstraten Dogshow CAC CACIB, CH EL Minja's Thsang-Pa won CAC CACIB at the 30years jubilee international dogshow at Hoogstraten wiht Best of Breed, CH EL Minja's Good as Gold won best female with CAC.CACIB this same dogshow, Lhasa Apso's from several countries were presented, thank you judge Mr George Kostopuolos from Greece. Le Sajnim Farah Dibah at the airplane Swiss Air to Dar Es Salam. 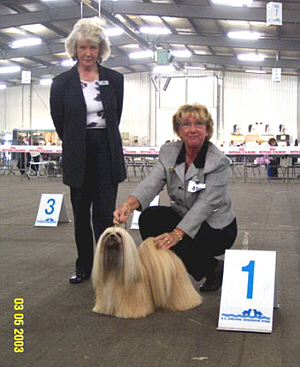 September 7, 2003; New Champion at Luxembourg International Dogshow Multi CH EL Minja's Dream On obtain her Luxembourg Champion title and International Champion title as well she was awarded as The Best Lhasa Apso female with CAC/CACIB. august 31; International Dogshow Rotterdam in Ahoy complex, BIS,BISS,Multi Champion EL Minja's Thsang-Pa won Best male with CAC/CACIB and Best of Breed under judge Mr V.O'Brien from Ierland and Res.Best in Group under Mrs J Toebak van Valkenburg. BIS,BISS,Multi Champion EL Minja's Thsang-Pa and judge Mr V.O'Brien. August 24; The well organized Sint-Romboutscup Int.Dogshow, BIS,BISS,Multi Champion EL Minja's Thsang-Pa won Best male with CAC and Best of Breed under judge Mrs Roos-Borjeson. BIS,BISS,Multi Champion EL Minja's Thsang-Pa and judge Mrs Roos-Borjeson. August 16/17; USA ,Colorado, Greeley CH. EL Minja's Walk onWater picked up 2 more Best of Breed Wins at the Greeley Kennel Club one under judge Ms. Patricia A. Gellerman and one under judge Miss Dolores H Maltz. 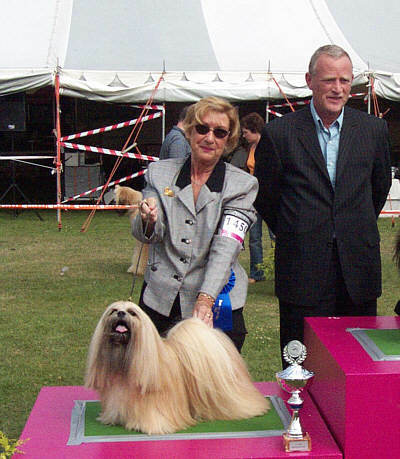 11 august ; Le Sajnim Indian Dream and his sister Shanti obtain on there start both 1th excellent award at a local CAC dogshow in Belgium , Leuven under judge Mrs Rossier from Swisserland. 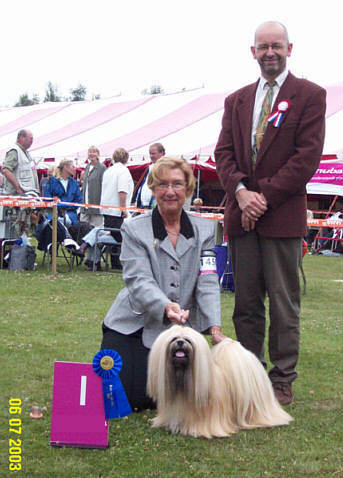 7july 2003 , The Great Limburgia dogshow BIS,BISS,Multi Champion EL Minja's Thsang-Pa won Best male with CAC and and Best of Breed, The Best Lhasa Apso female with CAC become Multi CH EL Minja's Dream On. Thank you judge Mr A Hilverda from the Netherlands. BIS,BISS,Multi Champion EL Minja's Thsang-Pa finished Res.Best In Group under Judge Mr P.Prins also from the Netherlands. 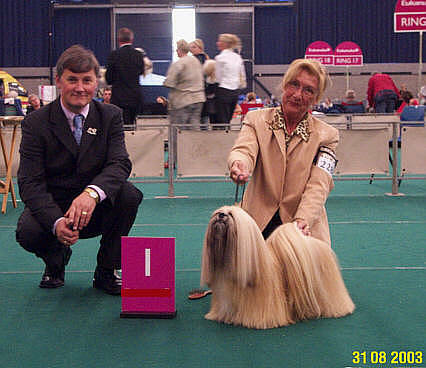 7 june 2003 , Pinkster dogshow at Arnhem in the Netherlands BIS,BISS,Multi Champion EL Minja's Thsang-Pa won Best male with CAC/CACIB and The Best Lhasa Apso female with CAC/CACIB become Multi CH EL Minja's Dream On and Best of Breed . Thank you judge Mrs Toebak van Valkenburg from the Netherlands. Multi CH EL Minja's Dream On finished BIG4 under Judge Mr L. Havestock from Canada. 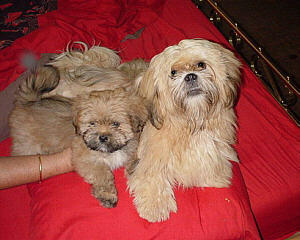 EL Minja's Lhasa Apso dogs, Proven quality! 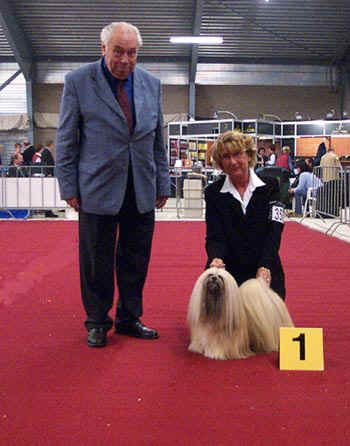 Januari 26, 2003 ; CH EL Minja's Thsang-Pa won CAC CACIB at the 30years jubilee international dogshow at Mouscron Belgium wiht Best of Breed, CH EL Minja's Good as Gold won best female with CAC.CACIB this same dogshow, Lhasa Apso's from several countries were presented! In the Group 9 CH EL Minja's Thsang-Pa won res.Best in Group. CH EL Minja's Thsang-Pa res.Best in Group at Mouscron. Januari 26, 2003 ; CH EL Minja's Only for pleasure won at Castrop in Germany CAC and best of breed under judge Mr Jungblut and she won Best In Group as well. 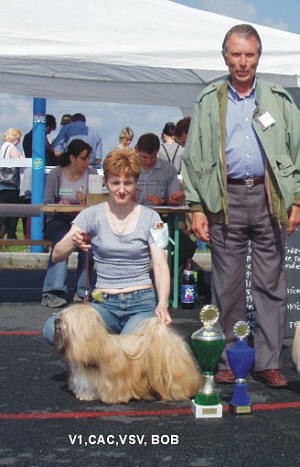 Champion: EL Minja's Ga Ga obtain her German champion title at Castrop dogshow. 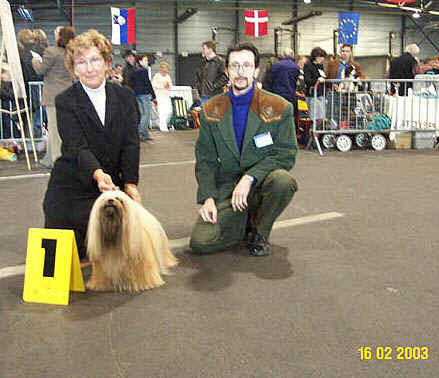 At this same dogshow EL Minja's Gratefull won the CAC at the male classes.